If you’re that rock n’ roll, edgy gal who loves studs and leather, Della Giovanna’s 2014 fall collection is just for you. This fall bridal collection was inspired by Della Giovanna’s contemporary design background, and is definitely for the modern bride who wants to make a statement. This 2014 bridal collection includes not only gowns, but corset tops and skirts, and some pieces are versatile enough to bring into your everyday wardrobe–bonus! You’ll see various silhouettes with fun surprises like white leather, lace, studs and python skin. Don’t believe us? Check out these super cool, edgy wedding gowns for yourself! 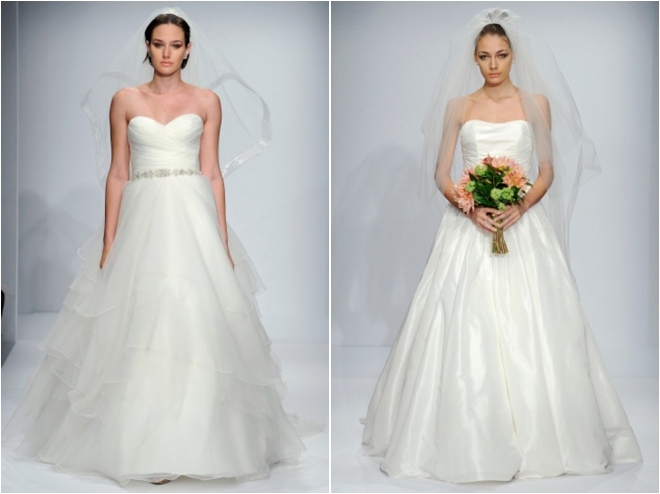 A Fresh, New Mia Bridal Couture + A Fabulous Watters Trunk Show! With its chic and welcoming River Oaks salon, and its reputation for gorgeous wedding gowns and highly personalized service, Mia Bridal Couture has long been a favorite among style-minded Houston brides searching for “the one.” And it just got even better. Sporting a fresh new logo, soon to be launching a new full-featured website, and now featuring design houses Enaura, Pronovias Atelier and Ysa Makino for the very first time, Mia Bridal Couture is taking bridal glamour to a whole new level. And what better way to celebrate its sparkling new look than with a hot-off-the-New-York-bridal-market-runway TRUNK SHOW, Friday and Saturday, Nov. 29-30, showcasing the latest Fall 2014 looks from perennial bridal favorite Watters. Call 713.622.2022 now to book your appointment for a Thanksgiving-weekend date with these dazzling dresses…and give yourself something to be truly thankful for! We’ll be showcasing Mia Bridal Couture all this week, so be sure to follow us on Facebook, Twitter and Pinterest for a peek at stunning new gowns, upcoming Mia Bridal Couture events—and an exclusive Mia Bridal Couture interview with one of the most exciting new bridal designers on the planet. And happy shopping, Houston bride!